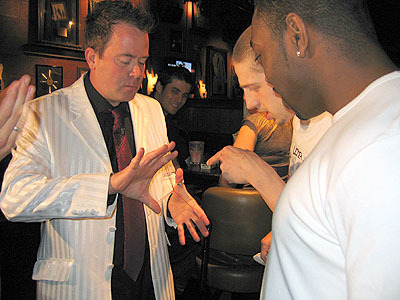 You have people milling around at an event waiting for things to happen...Why not try Mixing and Mingling With J P's Close up Magic. When people see things happen right in front of there noses, it totally blows them away. They will not forget your event for a very long time. Jp can mix through a crowd at just the right pace so everyone has the opportunity to experience the Magic. J P always has the highest regard for others, this with a warm personality is a winning combination for your event. Ideal for Weddings, Corporate Social Events, Trade Fairs, Festivals, Car Showrooms and just about anywhere you have people you want to impress.